Beautifully situated in the heart of Leeds, the City Museum has a lot of local stories to tell. Suitable for people of all ages, be prepared to explore ancient history, contemporary issues, as well as engage with Leeds' social, economic and geographical history. Entry to the City Museum, a beautiful building, is free, and there are people at the door happy to talk about the current exhibitions and make recommendations about what there is to see! Some exhibitions change seasonally, so it's worth making repeat visits once in a while. Current exhibitions include the 'Treasured! Smuggled? Stolen? Saved?' exhibit, which showcases an array of objects from around the world which have found themselves in Leeds one way or another. Each of the objects have very unique stories behind them, and are often one-of-a-kind (from a doll from War-era Germany to a large African decorated shield). The exhibit allows you to explore these items in an interactive manner (via a passport stamping system) and encourages you to think about the circumstances in which these items were found and if it was a good thing. It's particularly interesting and well worth a look. The Museum also has a number of ancient historical exhibits, including Greek pottery, Roman statues and an Egyptian Mummy! Leeds City Museum offers an incredibly interactive display which facilitates learning and piques curiosity. 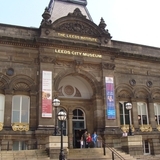 There are also the Leeds Gallery, which showcases the history of Leeds from bronze-age jewellery to Victorian death warrants.There is a lot to see and will supply a fun-filled afternoon.